This image shows a wide-field view of the Lagoon Nebula, captured from the Cumeada Observatory, headquarters of the Dark Sky Alqueva Reserve in Portugal. Also known as M8, the Lagoon Nebula is a magnificent colorful complex of hot gas and dark nebulosity located in the Sagittarius constellation. Miguel Claro is a professional photographer, author and science communicator based in Lisbon, Portugal, who creates spectacular images of the night sky. As a European Southern Observatory photo ambassador, a member of The World At Night and the official astrophotographer of the Dark Sky Alqueva Reserve, he specializes in astronomical skyscapes that connect Earth and the night sky. Join Miguel here as he takes us through his photograph "The Wonderful Lagoon of Deep Space." The Lagoon Nebula, also known as M8, is a magnificent complex of hot gas and dark nebulosity located 5,000 light-years away from Earth in the constellation Sagittarius. Shining at magnitude 5, which is barely bright enough for the human eye to distinguish in the night sky, M8 can be seen with the naked eye from a dark-sky location. The dark dust filaments inside the nebula were created in the atmospheres of cool giant stars and in the debris from supernova explosions. Small dark knots and globules that are condensing protostellar clouds are a sign that star formation is still happening. 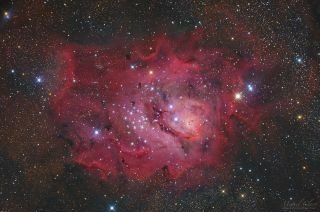 The Lagoon Nebula gets its name from the distinctive dark lane that runs through its heart.. At the left side of this dark lane is a bright star cluster known as NGC 6523. The nebula is so large that measures about 110 light-years across in space. To capture this image of the Lagoon Nebula, I used a Takahashi FSQ-106ED refractor telescope and an EM-200 autoguided mount as well as an Astrograph GSO RC8 F/8 with a Nikon D810a DSLR astrophotography camera. The camera was programmed to shoot with an ISO setting of 2500 and an exposure time of 180 seconds. The final composite combines 22 frames from both telescopes with a combined exposure time of 66 minutes. Image processing was completed with PixInsight 1.8.5 and Adobe Photoshop CC 2019. All the images were captured from the Cumeada Observatory, headquarters of the Dark Sky Alqueva Reserve, in Reguengos de Monsaraz, Portugal.